With kilometres of coastlines, empty beaches, volleyball nets already fixed, Goa pretty much offers every activity for those looking to get out of the gym and indulging in some outdoor and fun fitness regimes. Volleyball is really popular as a sport in Goa and Arambol leads the way with pretty much every shack on the beach putting up a net. 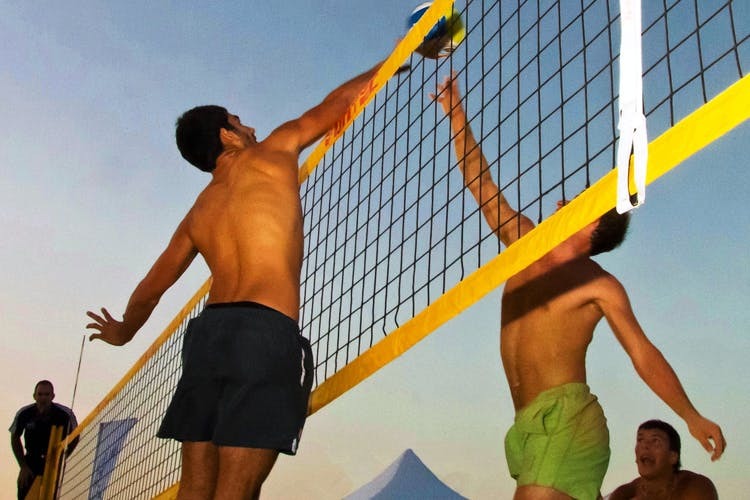 Of course, you will also find nets and players on other beaches like Ashvem, Calangute, Candolim, Colva, Patnem, Miramar beaches to name a few, but Arambol is where the best volleyball action is at. Yoga is another popular activity to do at the beach. There are a lot of groups or schools that conduct regular workshops on the beach and you can contact the schools directly more details. Or then just roll up your yoga mat and head to Morjim, Keri, Patnem beaches where you are bound to find fellow enthusiasts early in the mornings practicing their Surya Namaskars. Running is something that one can do at pretty much any beach in the North or South Goa. But if you looking to run in solitude, then the beaches of Galgibaga, Keri, Ashvem, Varca and Morjim are your better bets. And nothing beats running barefoot in the sand, with the waves lapping at your feet, the salty sea breeze and spray to keep you going. Frisbees are making a comeback! Frisbee mania has picked up in Goa big time, with even tournaments taking place. Of course, all you need is a frisbee and some friends to play with, but if you getting serious about it then head to Mandrem beach where you will find different groups and teams practicing or playing there. So the idea is just to join in the melee and start working on your fitness goals. There is nothing as refreshing as a dip in the sea. And Goa offers some pristine and blue waters to swim in. Of course a lot of the beaches are rocky and with unsafe currents or no lifeguards. So best to stick to beaches that are manned by lifeguards like Candolim, Colva, Uttorda, Varca, Morjim, Ashvem and Mandrem. And also important to follow their guidelines with respect to the flags they put there to send the message whether it is safe or not to swim at a particular time. Do carry your own refreshments as most shacks are closed early in the mornings.